Scourge, Rare. Form of the Dragon is an example of flavor being represented perfectly from a mechanical standpoint. Let’s walk through this step by step. 1) At each one of your upkeeps, you get to blast something for 5. Awesome, you get some free damage every turn! Enough to kill most threats or to chunk down your opponents. You’ve turned yourself into a FREAKING DRAGON and you’re breathing fire at things. I count that as a mechanical/flavor success. 3) Since we are now a FIREBREATHING HELLKITE OF DOOM, our favorite enchantment makes it so those peons without flying can’t even attack you. A one-sided Moat effect from a red card, and yet it fits perfectly from a conceptual standpoint. -Play Paradox Haze. In fact, run a whole playset of them. The idea of burning something/someone for 10 each turn (assuming you only have 1 out) is fantastic. Immolating something/someone for 25 each turn (if you have 4) is like going to magical Christmas land! 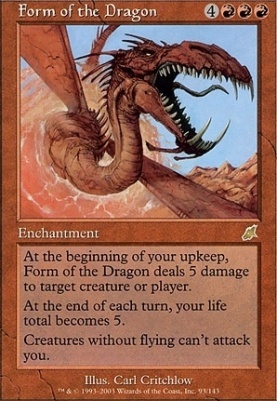 -Play Form of the Dragon in conjunction with cards that “donate” permanents to other players such as Zedruu the Greathearted or Puca’s Mischief. What’s that? Your opponent has 70+ life? Would they like to become a dragon? (who doesn’t?) No? (LIAR!) Well, make them anyway!